When people talk about the noise emitted by CRAC, CRAH and chillers, misunderstandings frequently arise. In specifications you will occasionally see doubtful requirements for equipment noise emissions or noise levels that data centers are supposed to comply with. This blog aims to shed some light in the darkness of these unloved parameters. Air conditioning units, chillers, and air handling units are all noise sources that produce sound and emit it into the environment. And so are servers, UPSs and generators. How much sound a noise source generates depends solely on its operating conditions, not on the environment in which it is located, nor on the distance from the noise source at which the sound is heard or measured. On the other hand, the volume of the sound that is actually perceived or measured does depend on the environment and distance from the noise source. So there we have it: a very simple description of these two parameters! 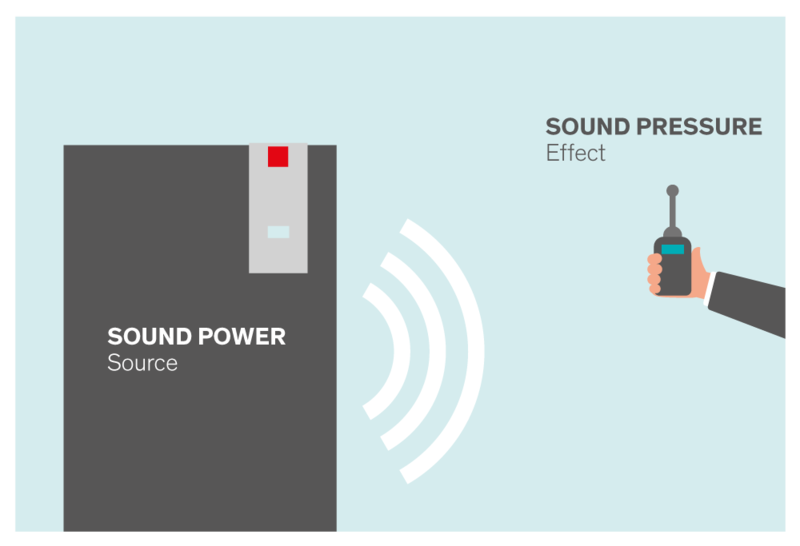 Sound power denotes the acoustic energy emitted by a noise source. Sound power varies depending on the operating conditions of the noise source – in our case an air conditioning unit and chiller. Whether the air conditioning unit is on a test bench or installed in a data center is completely irrelevant. If the operating conditions are the same, an identical sound power will be measured in both cases. It’s completely different where sound pressure is concerned. Let’s assume we have two air conditioning units, one on the manufacturer’s test bench and one installed in the data center, but with identical operating conditions. The sound pressure that is measured at a distance of, say, 2 m in both cases can differ considerably, because it depends on the ambient conditions. On the test bench, a relatively small space with reverberant walls that reflect the sound, a much higher sound pressure level will be measured than in the data center, which is a relatively large space with some walls and ceilings that are sound absorbing. This difference may amount to several dB(A). A specified sound pressure level can only be explicit and comparable if the ambient conditions and distance from the noise source are also stated, e.g. a sound pressure level at 2 m distance in free-field conditions. Free-field conditions are idealized conditions and describe an environment in which the sound can propagate in all directions unhampered and without sound reflections. So when comparing and specifying noise data, we must take care to compare apples with apples, so that the requirements for noise emissions are crystal clear.